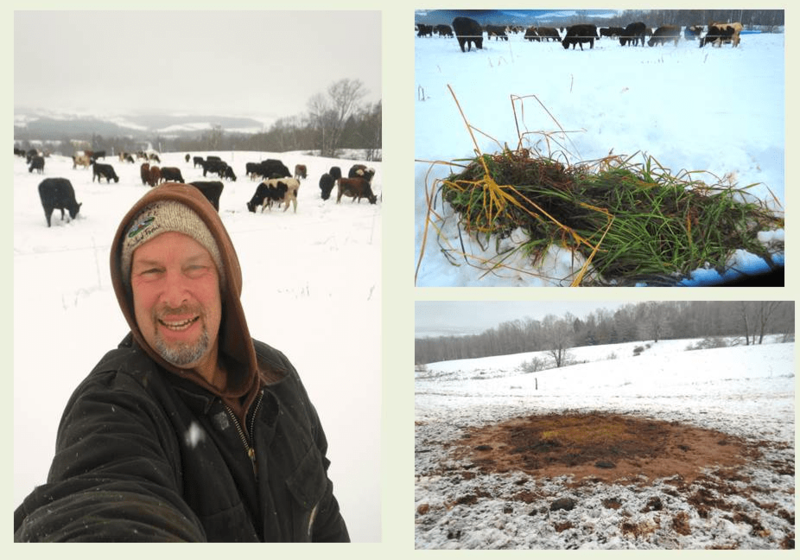 Rain, Mud, Frozen Forage, and Snow, OH MY! 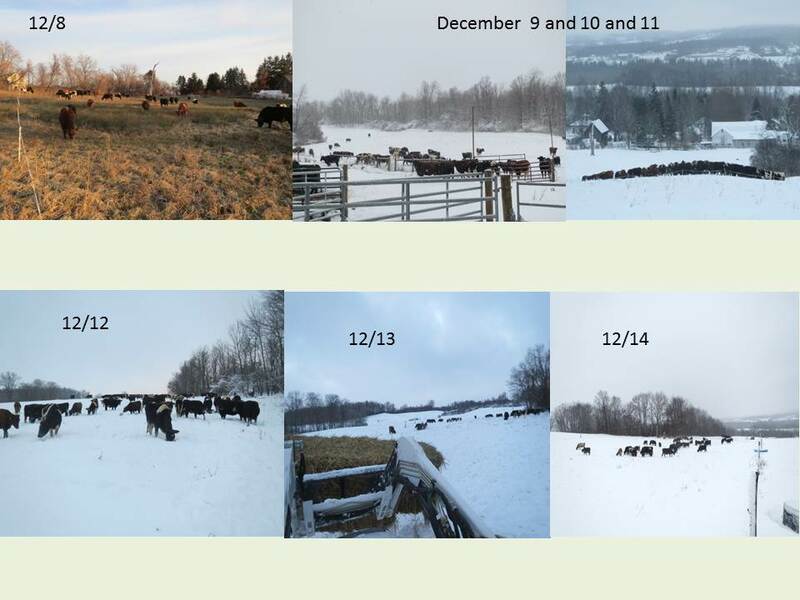 Here’s more on the realities of winter grazing. 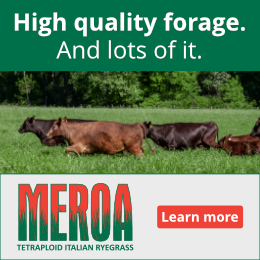 Editors Note: Troy Bishopp (aka The Grass Whisperer) has been sharing what’s happening on his farm as he feeds his custom-grazed dairy heifers on stockpiled forage. What we really appreciate about his efforts is that he’s truly transparent about the challenges he faces, so that you’ll know what you could be facing when you try it on your operation. 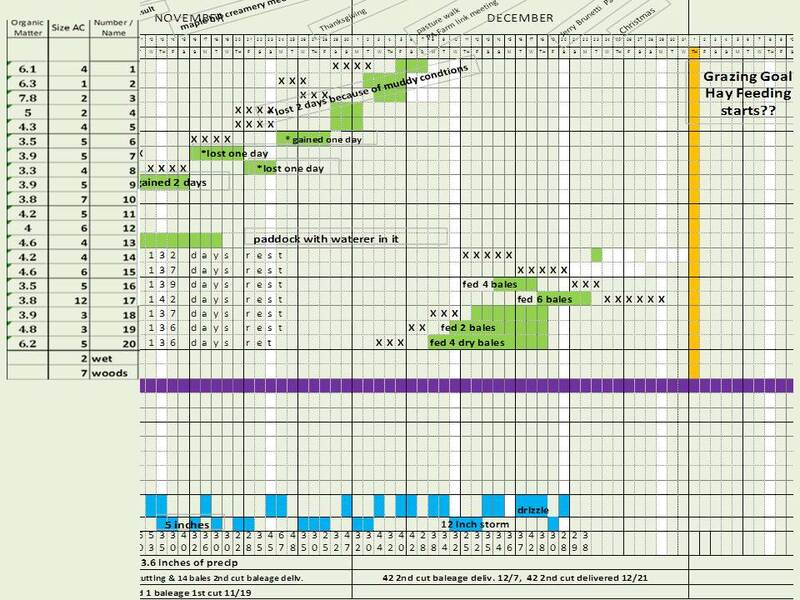 Here he shares what happened, including the stress of figuring out how to make it all work, from the end of November into December. Even though they had access to water during the snow event on Thursday and Friday, they never went for water. The forage was more succulent as it was only 100 day’s old. They also had the woods for cover, and they took full advantage of it. Just another reason to have woods and hedgerows integrated into your operation, right Brett Chedzoy?? 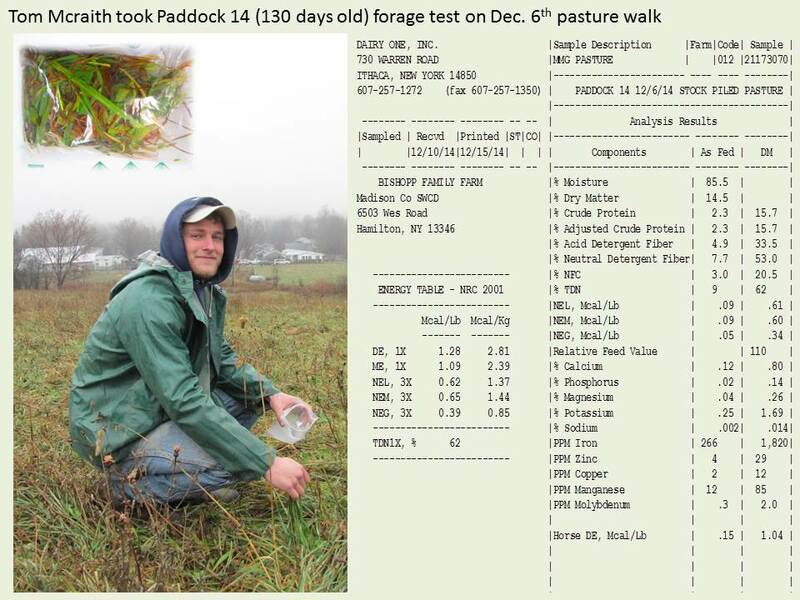 Forage value remains high as you can see from this forage analysis done on 130 day old forge. Click to zoom in. 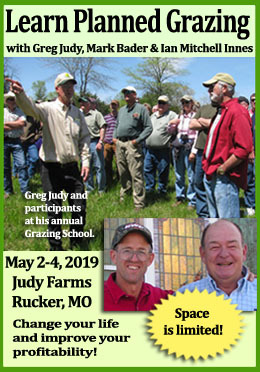 If you’re a regular participant and grazing practitioner, you’ve seen that up to now things have been pretty steady according to the grazing plan except for some quick one and done weather events, animal impact issues and changes in grass availability. (If you haven’t had the chance to read the whole series, click here to catch up.) After our December 6 pasture walk at the farm, and hearing from my peers, I was feeling pretty satisfied that everyone saw the potential, the forward implementation plan, the happy cows, and agreed I was doing pretty well. But now, I’ve got a little dose of reality and transparency for ya! I left the farm and work for Harrisburg, PA December 9 and 10 to speak at the 1st Annual Growing Pennsylvania’s Organic Farms Conference amidst predictions of a winter snow storm. While my time hanging with Maryland’s Ron Holter, PCO’s Lee Rinehart and the farmer guests was great, I left early on Wednesday to get thru the Pennsylvania Mountains before the snow hit. Heavy rain on Tuesday turned to snow on Wednesday as I got home to a foot of wet snow and blinding wind. Suffice it to say, the grazing plan was altered. Snow, and more importantly the type of snow, is the bane of utilizing stockpiled grass especially when it’s mostly cool season orchardgrass, clovers and succulent forbs. 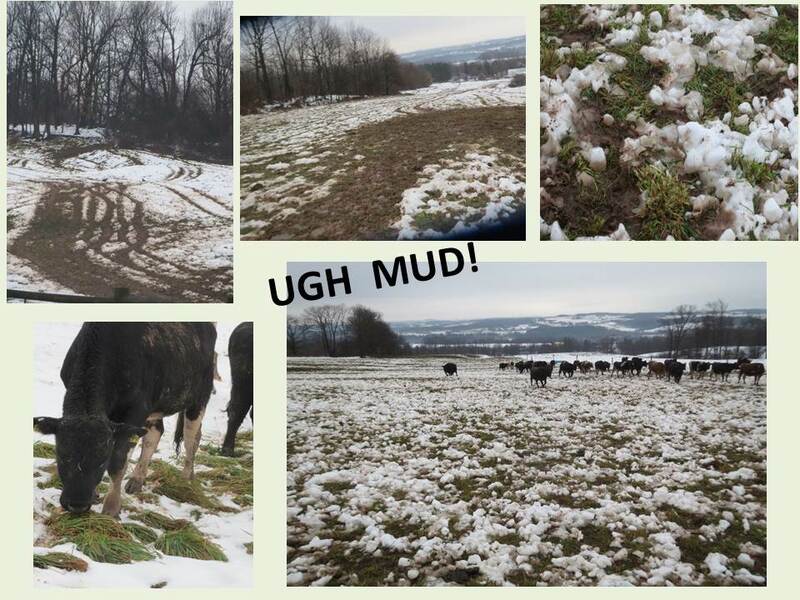 Wet, drifted snow limits efficient use by cows because they have to really dig which means they need even more energy to harvest which means even more pasture. The kicker is, as soon as they step they compact the snow even more, which, you guessed it, means more energy to get it or it just becomes worm food. It’s frustrating to grow cow feed for 130 days and then have the worms eat it. Since we are contract grazing the next generation of organic cows, I need to be sure they are well taken care of so I can’t force them into a “graze it or die scenario” like I had when I had dry momma beef cows. Add to the mix, 4 green-weaned weanling bulls and you can see why I am feeding some hay whereby conceding that the weather has bested my 100% grazing program. But I knew this would happen eventually so there is plenty of feed on hand. A good grazing plan has contingencies. In past years the snow didn’t come till later so this wasn’t needed and I just continue grazing. Friday, Saturday and Sunday (Dec. 12,13,14) was marked by a 34 degree drizzly rain which was great for snowman making in the day but crusted over during the night making it a pain for grazing. Nevertheless, I am still giving them a fresh paddock every day to minimize waste and am supplementing with a bale of hay. This scenario keeps them busy looking for the grass because of competition, concentrates some fertility and provides some good protein feed and the hay helps keep the rumen “mat” and satisfies my stress level with regards to animal welfare. It’s tough to find the right balance because this has an economic impact as well as an environmental one. The morning of Monday, December 15th finds me a little down because underneath the snow is unfrozen sod which means MUD: Mud around the big square bales because I don’t have any round bales to roll out, mud from hoof prints and mud from a tractor tires delivering the said hay. Part of me wants to put them in the sacrifice area with a hardened surface and say to heck with grazing right now. Part of me is questioning whether it would have been better to make the hay on this 30 acres versus grazing at this point, part of me wants to open up all the paddocks and say have at it and discontinue hay feeding for as long as possible and spreading the herd out over 30 acres. The problem is I’ve got too damn much pride and there is “the goals” to contend with, including fertility transfer. On the plus side, the well-rested grass that gets “wasted” will be strong in the spring and feed a bunch of microbes. 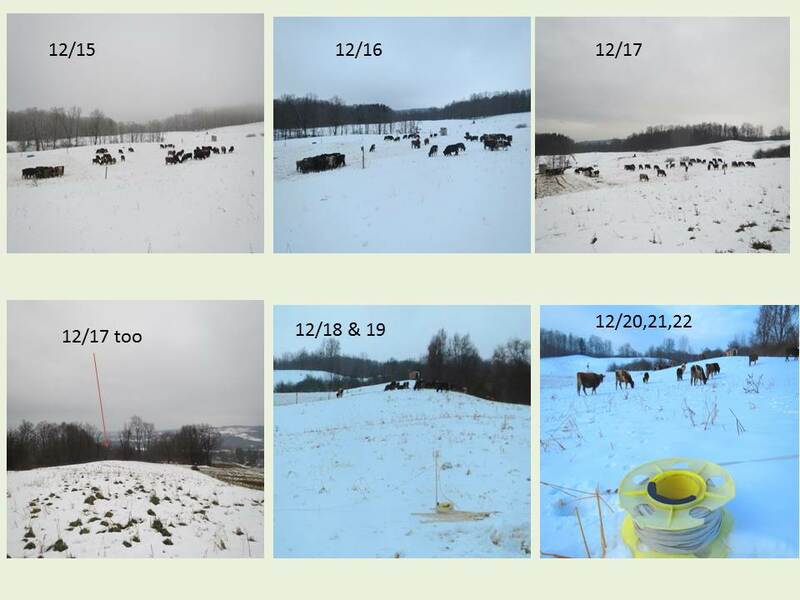 The week of December 15 – 22 started warm enough for the heifers to push snow around in little snowballs trying to reach the grass to frozen, crusty, snow pack where they would have to work really hard to break through. Mud was an issue and then not so much. We have not had sun since December 7th. I’m feeding one big bale per day along with the stockpile which was not part of the original plan but is necessary given the weather conditions. If you look at the grazing chart you’ll see the paddock shifts have changed to accommodate more sheltered areas in Paddock 17. You’ll also see I’ve lost a few more days of grazing since the mud and hard snow have plagued the ground and I’m trying to minimize the animal impact. The grass underneath is still of good quality and they are performing pretty well given the circumstances. 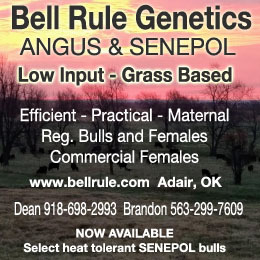 A big ole’ beef cow might be a better match for these tougher conditions as they have more reserve fat to work harder. For Christmas Week, we used paddock 14. I staged a bale in each paddock shift (while it was frozen) so I wouldn’t have to start a tractor all week. All I had to do is take a break wire down and get back to the house to be with family. I’m stressed because I’m not in complete control which is tough for me. You can see how decision-making needs to be flexible and why you need a few mentors or consultants to help you mull over these decisions and keep you from melting down. Looking ahead into coming weeks, I see trouble as the temperatures at night go below 20 which will freeze the melty snow and make it even more difficult for the animals to get to even though it might help with the hay hauling. These postings give you a glimpse into my opportunities and challenges of extended grazing. There’s no free lunch, you’ve got to be monitoring all the time. Decisions need to be made about animal performance and comfort, environmental impacts, economic measures and family needs when you farm with Mother Nature. I guess that’s the life of a farmer and probably why only 1% of us are insane enough to carry on the independent traditions. See you next week and thanks for your participation. You can read more and see more pictures at my website. Click on over here to see the rest in this series. We had nearly an identical weather pattern here in Southern Iowa. The mud was the worst. During a four day period I moved 61 fall calving beef pairs to our abandoned railroad track paddock and just hayed them. When the ground froze, we went back to grazing the pasture paddocks again. Thanks for the great articles! Bill, much the same pattern here in Lillooet, BC Canada also. When it got soggy we let the herd have more ground to minimize the damage. We’ve been joking that we have had early break-up 1 and 2 already this winter. Thankfully, we’re frozen back up now. But just now I was checking my weather… It’s -5C/21F and snowy right now, and the forecast says in two hours it will be +5C/41F… Hmm. I guess I’ll just fall back on my old motto: Expect nothing and be prepared for anything.